The population figures on 31 December for each year has been used as the population data for 2008 to 2017. The population figure on 31 December 2017 has been used in the estimate data for 2018. According to the financial statement estimate data for 2018, the external operating expenses of municipalities in Mainland Finland were 3.3 per cent higher than in the previous year and totalled EUR 36.9 billion. External operating revenue grew by 4.6 per cent to EUR 7.5 billion. Operating expenses and revenue increased in part due to certain recording procedures in purchases of services between municipalities and joint municipal authorities. 1) The operating margin totalled EUR -29.1 billion and it weakened by 3.4 per cent from the financial statements of the previous year. 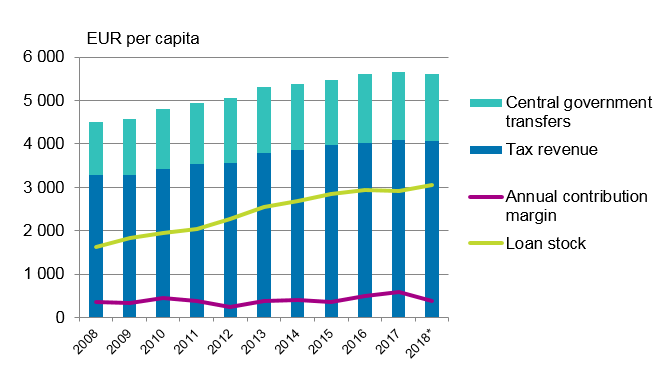 According to the financial statement estimates, the tax revenues of municipalities in Mainland Finland amounted to EUR 22.3 billion in 2018. They went down by 0.5 per cent from the previous year’s financial statements. Municipalities received EUR 8.5 billion in central government transfers to local government, and they decreased by 0.6 per cent. Tax funding formed of tax revenue and central government transfers to local government was EUR 5,613 per capita. 2) The combined annual contribution margin of municipalities decreased from the previous year by 35.5 per cent and was EUR 2.1 billion. The annual contribution margin was negative for 38 municipalities in the financial statement estimates. In the previous year, the annual contribution margin was negative for four municipalities according to the financial statement data. Based on the municipalities’ estimates, their combined loan stock was EUR 16.7 billion at the end of 2018. It was EUR 3,051 per capita. 3) The loan stock grew by 3.8 per cent from the period one year earlier. Municipalities’ investment expenses amounted to EUR 3.6 billion in the year. The growth from the year before amounted to 3.4 per cent. According to financial statement estimates, the operating expenses of joint municipal authorities in Mainland Finland without internal items totalled EUR 14.7 billion in 2018. External operating revenue amounted to EUR 15.4 billion. Operating expenses grew by 8.3 per cent and operating revenue by 7.2 per cent from the previous year. The annual contribution margin fell by 15.1 per cent and was EUR 0.6 billion. In the financial statement estimates concerning 2018, the combined loan stock of joint municipal authorities was EUR 3.9 billion, which was 11.4 per cent more than in the previous year's financial statement data. Investment expenses increased by 2.1 per cent to EUR 1.2 billion. 1) A number of municipalities transferred the responsibility for the organisation of healthcare and social welfare services to the joint municipal authority they had set up, but municipalities were still responsible for providing the services. Municipalities recorded sales revenue and purchases of services from joint municipal authorities on a gross basis. This recording procedure increased municipalities’ external operating revenue and expenses, but it did not have a net effect on the operating margin. On the level of whole Mainland Finland, this procedure caused around one-third of the growth in municipalities’ external operating expenses and nearly the entire growth in operating revenue. The effect does not extend to the time prior to the year 2018. 2) The population data used were the population of Mainland Finland on 31 December 2017. 3) The population data used were the population of Mainland Finland on 31 December 2017. ISSN=2343-4139. 4th quarter 2018. Helsinki: Statistics Finland [referred: 25.4.2019].